This is a short guide to explain how to program an AVR microcontroller (like what powers an Arduino Uno) directly from the GPIO pins on a Raspberry Pi. Why would you want to program an AVR from a Pi? 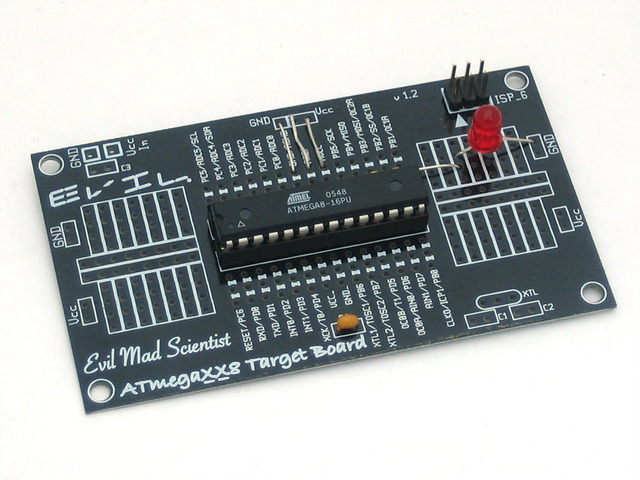 If you're building up an AVR-based board or product from scratch you'll need some way to program code onto the chip. Typically dedicated tools like the USBtinyISP are used to program an AVR through its in-circuit serial programming (ISP or ICSP) pins, however with the latest version of the avrdude programming tool you can actually use Linux GPIO pins to program an AVR directly--no dedicated programmer required! This guide will walk you through how to install and use avrdude to program an AVR microchip or Arduino through its ISP pins with a Raspberry Pi. Note that this tutorial is somewhat advanced and targeted at people who are familiar with programming an AVR chip directly instead of using friendlier tools like the Arduino IDE. It will help to be familiar with setting up a breadboard Arduino and loading its bootloader through an ISP programmer. If you're a beginner or new to Arduino, stick with using the Arduino IDE to program your board. Raspberry Pi - Any model will work, but note that you need 4 GPIO pins free for each AVR that will be programmed at a time. An AVR chip & development board or an Arduino board that exposes the ICSP pins (like an Arduino Uno). Breadboard and wires to connect the ICSP pins of the AVR/Arduino to GPIO pins on the Raspberry Pi. You'll need to compile and install the latest version of the avrdude programming tool on the Raspberry Pi. These instructions assume you're using a version of the Raspbian operating system and are familiar with how to connect to the terminal on the Raspberry Pi. Also note these instructions are written for version 6.1 of avrdude. Earlier versions won't work because they don't have the required linuxgpio programmer type. Later versions might work, but they might require more dependencies or a different configuration. Stick with version 6.1 to follow these instructions. To save some of the trouble of compiling avrdude a pre-compiled package for Raspbian has been added to Adafruit's Rasbian package repository. If you just want to get up and running as fast as possible follow these steps to install the package. If you run into an issue or would like to compile the code yourself, skip down to the compile avrdude section. First follow the steps on this page to add Adafruit's package repository to your Raspberry Pi. Answer yes to any question about installing packages, and after a moment the updated avrdude package should be installed. Skip down to the verify installation section to continue. Once avrdude 6.1 is compiled and installed, continue on to learn how to configure avrdude to program using the GPIO pins. To program an AVR from the Pi you'll need to have 4 GPIO pins free on the Raspberry Pi. These pins will connect to the AVR's ISP/ICSP MOSI, MISO, SCK, and RESET pins. In addition you'll connect the Pi's 5 volt power and ground to the AVR to power it during programming. If you're using an Arduino Uno you can access all the required pins from the small ICSP header on the far end of the board. 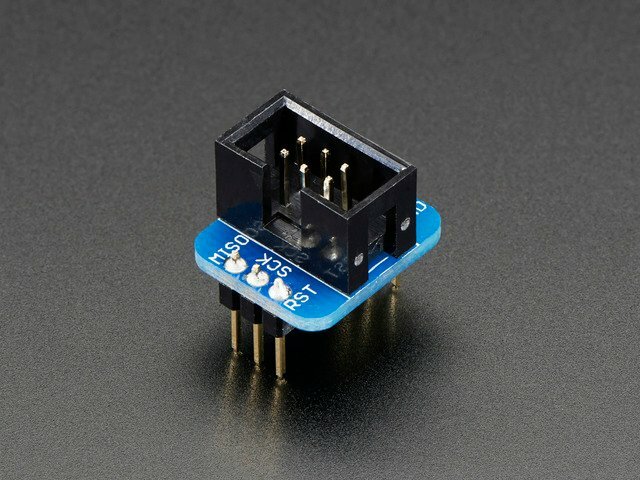 Arduino ICSP VCC to Raspberry Pi 5 volt pin. 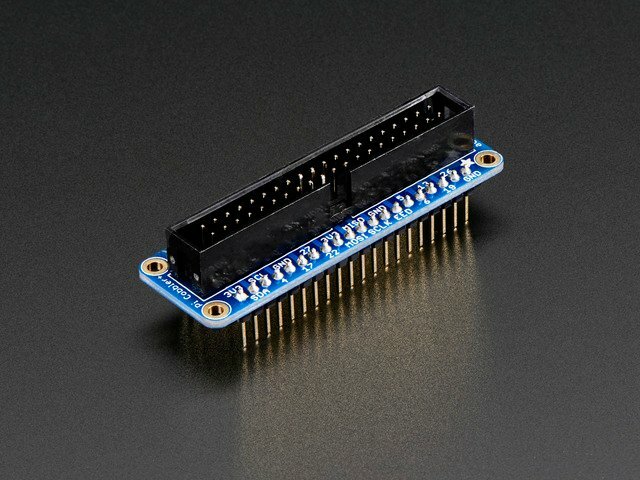 Arduino ICSP GND to Raspberry Pi ground pin. Arduino ICSP RESET to Raspberry Pi GPIO #12. Arduino ICSP SCK to Raspberry Pi GPIO #24. Arduino ICSP MOSI to Raspberry Pi GPIO #23. 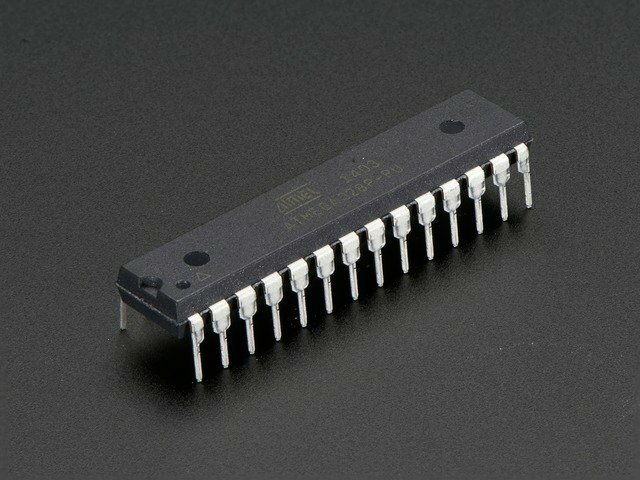 Arduino ICSP MISO to Raspberry Pi GPIO #18. You'll need to create a custom avrdude configuration file to tell avrdude what GPIO pins to use for programming the AVR. It's easiest to copy the default avrdude.conf file and make the necessary changes to it. The avrdude.conf file will be in one of two spots depending on how you installed avrdude in the previous section. If you did the easy install method to install through a package then avrdude.conf is in the /etc/avrdude.conf location. However if you did the manual install method to compile the code and install it then avrdude.conf is in the /usr/local/etc/avrdude.conf location. # Linux GPIO configuration for avrdude. # Change the lines below to the GPIO pins connected to the AVR. This configuration will create a programmer with name 'pi_1' and assign the ICSP pins to the provided GPIO pin values. If you've hooked up the ICSP pins to different GPIO pins make sure to modify the configuration to match your setup. Also note that you can create mulitple programmer sections if you're programming multiple AVR chips from the same Raspberry Pi. Each programmer section needs to have a unique name assigned with the id = "name" line. In addition each AVR needs a distinct set of 4 GPIO pins configured for its ICSP pins. Once you've modified the configuration file save it and quit nano by pressing Ctrl-O, enter, and then Ctrl-X. Continue on to learn how to use avrdude with the custom GPIO programming configuration. Now you're ready to program the AVR using the Pi's GPIO pins! Make sure you've followed all the steps to this point and have compiled, installed, and configured avrdude for GPIO programming. The file /tmp/build6154610255332504576.tmp/Blink.cpp.hex is the output .hex file that can be written directly to the AVR/Arduino using avrdude. Grab the .hex file and copy it to your Raspberry Pi. Another way to generate a .hex file is to setup your own avr-gcc toolchain and compile code for the desired chip. This can be a somewhat daunting process so I recommend using Arduino's prebuilt toolchain. However if you're going at it yourself take a look at the instructions on setting up avr-gcc here--good luck! is specified with -C, and the name of the programmer is specified with -c. If you're using a different chip, configuration file path, or programmer name be sure to change the values. System wide configuration file is "/home/pi/avrdude_gpio.conf"
If you see an error make sure you're running the command as root with sudo. Also go back and ensure the custom avrdude configuration exists in the expected location, the configuration has the specified programmer, and the programmer configuration is using the GPIO pins you have connected to the AVR. Also note if you receive an error that a GPIO pin is in use try changing that pin to use a different one in the programmer configuration. Again the -p option configures the chip to program, the -C option points to your custom avrdude configuration, and the -c option specifies the custom programmer configuration block to use. The -U flash... option tells avrdude to wipe and program the flash memory of the AVR chip, and to use the provided Blink.cpp.hex file. Change the name and path to the hex file to the appropriate value for the code you're writing to the chip. Congratulations, you've successfully programmed an AVR chip using the GPIO pins on a Raspberry Pi! If you program an Arduino board like the Uno using the method in this guide be aware that you might remove or overwrite the USB/serial bootloader. This can actually be useful if you need just a little more space in your sketch (the bootloader takes a few kilobytes of memory at the end of flash), however it means that you won't be able to program the Arduino using the Arduino IDE's normal USB/serial programming interface. Don't worry though you can burn the original Arduino bootloader back on your Arduino board to have it work with the Arduino IDE again. Check out this tutorial for information on burning an Arduino bootloader from a .hex file using avrdude. If you download the Arduino IDE look for a firmware .hex file in the hardware/arduino/avr/bootloaders/optiboot directory beneath the IDE's installation. 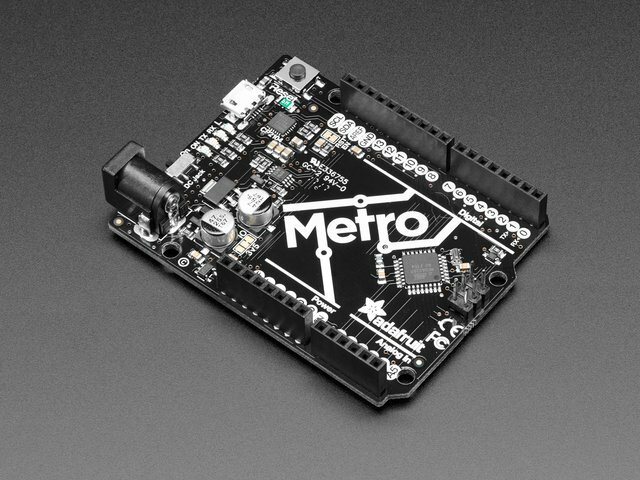 For an Arduino Uno the optiboot_atmega328.hex file is the bootloader file to use. Program this hex file to the Arduino using avrdude on the Raspberry Pi to restore the Arduino to its normal state and make programming work with the Arduino IDE again. This guide was first published on Jun 01, 2015. It was last updated on Jun 01, 2015.